* Red Filter Airaid SynthaMax QuickFit intake systems are specially designed to work with your factory cold-air inlet and filter housing, while providing your engine with increased airflow and horsepower. Airaid SynthaMax QuickFit bolt-on systems use your stock location, clamps, and clips. These intake systems will get rid of that restrictive air box lid and lousy paper filter. Airaid SynthaMax QuickFit intake systems include an Airaid SynthaMax premium non-oiled filter, which features high-tech filtration for superior output and long-lasting quality. No one else gives you the bold clean styling of our Aftermarket Dress Ups, Suspension and Performance Parts for your American Muscle Car like UPR Products! Click Here for Instructions Click Here for Dyno Results Fits these Vehicles: 2011 2012 2013 2014 Ford 5.0L 3.7L 3.5L Ecoboost Turbo V6 V8 Mustang Roush & Saleen Vehicles. 2010 2011 2012 2013 2014 Ford SVT Raptor 6.2L 2011 2012 2013 2014 2014 Ford Superduty F250 F350 6.2L Made in the USA! Airaid SynthaMax QuickFit intake systems are specially designed to work with your factory cold-air inlet and filter housing, while providing your engine with increased airflow and horsepower. Airaid SynthaMax QuickFit bolt-on systems use your stock location, clamps, and clips. These intake systems will get rid of that restrictive air box lid and lousy paper filter. 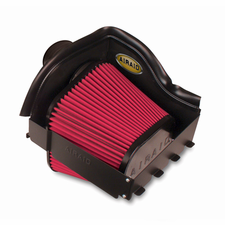 Airaid SynthaMax QuickFit intake systems include an Airaid SynthaMax premium non-oiled filter, which features high-tech filtration for superior output and long-lasting quality.